A researcher captured this image. 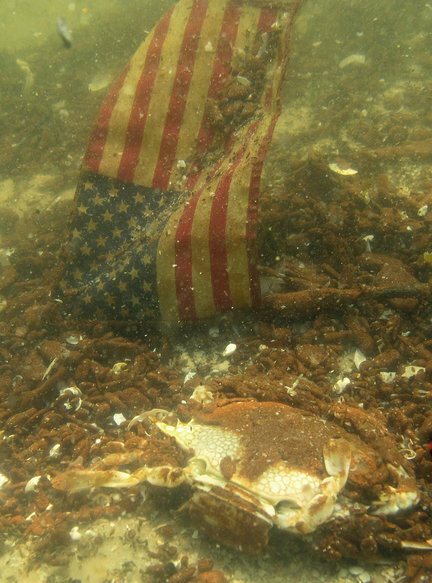 A discarded flag (or one that has fallen from one of the many vessels in the area) rests on the ocean floor amid the oil and the bodies of dead crabs. A two-inch layer of submerged oil is coating portions of the Gulf seafloor off the Bon Secour National Wildlife Refuge: a week after a smothering layer of floating crude washed ashore there. This scenario is being played out all along the Gulf shoreline. Collecting in pockets and troughs in waist-deep water, the underwater oil is looser and stickier than the tarballs that cover the beach. The consistency is more like a thick liquid, albeit one made up of thousands of small globs. Unlike tarballs, which can often be picked up out of the water without staining the fingers, the submerged oil stains everything that it touches. If you passed your hand through the material it would emerge covered in oily smears. There are a number of patches of submerged oil 40 to 100 feet off the beach, apparently collecting along rip currents and sandbars. The carcasses of sand fleas, speckled crabs, ghost crabs, and leopard crabs are spread throughout the oil, a thick layer of the material caking the bodies of the larger crabs - their claws looking as if they been turned into clubs made of oil. Huge schools of bait fish are hugging the shore, attracting large numbers of birds. King mackerel, Spanish mackerel, mullet, ladyfish, speckled trout, and other fish are congregating in massive numbers amid the sharks. The Dauphin Island Sea Lab measured large areas of low oxygen water just off the beach at Fort Morgan last week, beginning in water around 20 feet deep. Monty Graham, a University of South Alabama scientist, theorized that the population of oil-consuming microbes had swelled. Sea life begins to die if oxygen levels drop below 2 parts per million. "We saw some very low oxygen levels, some below 1," said Graham, of testing he conducted aboard a Dauphin Island Sea Lab research vessel. He said that the layer of low-oxygen water closest to shore off Fort Morgan began at the bottom and rose up 30 feet. Graham said he believed that the low oxygen levels were responsible for reports of strange behavior among fish: "The low oxygen explains things we've been hearing, like reports of flounder swimming on the surface." The low-oxygen levels offshore may also explain the dense aggregations of fish seen in the surf zone. The turbulent area near shore is naturally high in oxygen due to the influence of the breaking waves. There are numerous reports that suggest that oil is moving beneath the surface in Alabama waters. State officials conducting shrimp trawls in the Mississippi Sound two weeks ago found oil on their nets when they pulled them. More recently, BP contractors working around Dauphin Island reported oil coming up on their anchors. It's not just the sealife. Gulf coast residents are being hit hard as well. David Kotok of Cumberland Advisors estimates that one million jobs will be lost permanently in the Gulf coast oil services and supporting industries. As of ... Tuesday, June 15th, BP had paid less than 12 percent ($71 million dollars out of an estimated $600 million) of outstanding claims submitted by individuals and businesses. Two weeks after the disaster, BP had not paid a single dollar to the individuals or businesses harmed by the explosion and the oil spill. As of May 18th (four weeks post-disaster), BP had only paid $11,673,616. In apparent response to congressional oversight and the efforts of the federal government, BP began increasing their payments to affected individuals and businesses in the past few weeks. Although the oil spill disaster occurred on April 20th, BP has only begun to compensate individuals for their full loss of income in the past two weeks. We understand individuals continue to experience delays in the receipt of full income awards. BP has not paid a single bodily injury claim. As of Friday, June 18th, there were 717 claims submitted for bodily injury, including claims for respiratory issues, headaches, and skin irritation. BP has not paid a single claim for the diminishment in value of homes in the affected areas of the Gulf South, out of a total 175 claims submitted. Out of the 267 claims submitted, BP has paid only $169,371 in loss of income claims for affected restaurants. However, the lack of data from BP on the damage amounts requested by the affected restaurants or the number of claims paid makes it impossible for the Committee to determine if restaurants and other Gulf Coast businesses are being properly compensated. "I remain concerned that BP is stiffing too many victims and short-changing others," [Committee Chairman John] Conyers said. Reuters notes that BP is paying only a fraction of what the fishermen think they're entitled to. CNBC points out that BP is only paying fishermen one month's pay - pegged to pay from their slowest season. State officials in Louisiana and Florida say the payouts, so far, have been small and often too slow and that BP hasn't given them the data they need to adequately monitor the process. Some people claim the payout process is unorganized, and other said there is no system in place to account for how many days the fishermen have worked and no clear time frame for when they'll see the money they've earned. Some businesses have been asked to file 1,700 pages of documents before they can get a check. Fishing can bring in a lot of money in a very short period of time during the right season, but fishermen might be hard-pressed to provide evidence — bank statements, pay stubs — that can back that up. The same goes for many other businesses: if receipts are dwindling at a restaurant, or guests are cancelling at a resort, how is it possible to prove that the spill alone is responsible? "We're stuck in the middle," says Chris Camardelle, whose seafood restaurant in Grand Isle has been badly hurt by the oil spill. "So it's a tricky situation." Jane Hamsher notes that fishermen harmed by the Exxon Valdez oil spill have had to wait 20 years to see any money, and - for many fishermen - all of that money was been swallowed up by government fees and taxes. BP PLC says 90 percent of the compensation checks it has issued so far have gone to fishermen. Those who provide goods and services to fishermen are receiving next to no compensation. Given that the oil spill is killing not only fish and crabs - but the American dream for millions of Gulf Coast fishermen, shrimpers, tourist industry workers and others - the image in the photograph above is very powerful indeed. Update: A reader points out that Ben Raines of the Press-Register, and not Alex Kearns, gets credit. I have little sympathy for Gulf Coast fisherman. They engage in many ecologically unsound practices. It will be no harm to the eco-system if they are driven into bankruptcy. I have would have no sympathy for Jardinero1 as the Gulf fisherman tar and feather him and burn him at the stake. This photograph needs to go viral. I don't know how to do that single-handedly, but I'm sending it to everyone I know. Thanks for posting it. Where is the Oil Spill?